With the limits of digital rights still largely unclear what is and is not acceptable when accessing the otherwise private information of others is not always straightforward. If you forget to log out of a public computer is it legal for another person to snoop? Can social media posts be used in court? These and many other questions are somewhat unclear and defined by law, but it is typically agreed upon that you have the same rights in protecting your digital data and identity as you have in real life. But just knowing how others can snoop on you is important in order to help you protect your information regardless of the eventual legal ramifications for certain behaviors. In the instance of absentmindedly forgetting to log out of your email account on a public computer, a judgment in New Jersey held that a man that was found to have snooped in a coworker’s email left on-screen had not accessed the email account without authorization. Since the account access had been accomplished by the plaintiff, the defendant was found guilty of no crime since there was no evidence of hacking or other forms of electronic tampering. Analogically, you can liken this type of incidence to leaving your front door open then later realizing that someone looked inside. The obvious lesson here is to always logout of your accounts on public computers. There is substantial legal precedent finding that your computer is protected from police searches just like your house and person; it can’t be searched without a warrant. But the protection afforded to your phone depends on state. Due to the varying nature of search laws from state-to-state, the main method of combating potential access by the police, or even your boss, is to create passwords. You are never required to hand over passwords to anyone short of someone brandishing a court order. Data can also be encrypted to make it more difficult to understand the data on your device. Though it shouldn’t be surprising to anyone anymore, it is completely legal for employers to monitor both your work computer and smartphone usage. And it isn’t just general usage data that you employer can observe; sometimes even your conversations can be monitored. 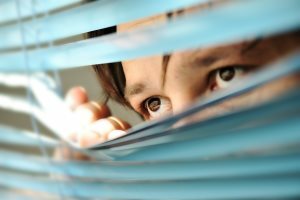 An employer could go so far as to install a keylogger on your phone or computer to snoop on every action you perform on the device. Just remember that if you are on a device owned by your employer you have no real expectation of privacy. The bottom line here is that if you want to avoid the potential for humiliation or legal troubles with what you do on public computers and other communication devices, such as those you use at work, act responsibly and keep your personal life out of your professional life even unto the electronic frontier. And remember that you are responsible for keeping your data safe from the prying eyes of public voyeurs.